Steve Brezenoff has created a very broken, heart-felt character in this book. We go through the story never quite knowing if Kid is a boy or a girl. The author has left it up to the reader to make that decision. It's a powerful novel, with a powerful message. It's a story about a young soul trying to find themselves among a sea of people telling them who they should be. Kid has stopped by the blog today to answer a few of my own questions. Describe a day in the life of a teenager homeless on the streets of NYC. I can really only answer for myself, not for any other kid. I can’t even answer for Felix or Scout, since they were always going off on their own. But for me? It’s just about whatever gets me through the day, and I’m lucky ‘cause I have a lot of people in the neighborhood who help me out. I guess a lot of street kids don’t. But it’s changed, depending on where I’m staying, too. I’ve slept at the warehouse, before it burned down, and that meant during the day I’d have to keep moving. So I did a lot of wandering around, looking for friends sometimes, or just some out-of-the-way shade. But like I said, whenever I was hungry or needed a drink, I usually had someone I could turn to. If you could play any song for Scout, which one would you choose? and why? That’s a pretty sappy question! Besides, I only play drums, so I can’t really play a song so you’d know what it was. Or do you mean, like, upstairs on Fish’s jukebox or something? Because then I’d choose “Kick Drum Heart” by the Avett Brothers. It suits me, since they like Brooklyn so much and so do I, and it refers to drums for me, and voice for Scout. What are some words of advice you would give a young boy or girl today, who doesn't feel accepted in their world? Maybe they’re in the wrong world, and they need to go out and find the right one. Do you know what I mean? Everyone’s got a family, even if you have to make it yourself. It's a hot summer day in the city, where do you find salvage to cool off? My favorite is still Fish’s basement, of course, but I also like finding a shady spot past the warehouses, right on the river, where I used to sit with Felix. McCarren Park is a good place for a nap, and with all the hipsters around, no one will even look at you twice. And it’s got a big pool, if you can squeeze your way in. It’s not shady, but a nice long soak is always good. You have 2 plane tickets to anywhere in the world, where do you go? and with who? I’d take Scout to Los Angeles. If Scout can’t become a star out there, then Hollywood is stupider than I thought. Thank you Steve & Kid for stopping by the blog today. 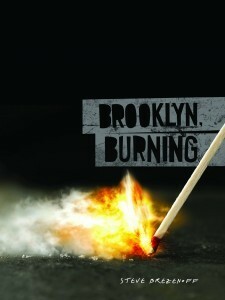 Be sure to pick up a copy of Brooklyn, Burning on September 1st. This post is part of the Brooklyn, Burning book tour hosted by Teen Book Scene.